Meanwhile in Cairo, the fourth edition of Food Africa, an international exhibition dedicated to the African food and beverages industry was taking place. Yesterday, the Intra-Africa Trade Fair (IATF), the first of its kind in Africa, began and is scheduled to run well into next week. Egypt is thus putting its money where its mouth is and focusing on strengthening and deepening its ties with Africa. And as it takes over the chair of the African Union (AU) in 2019, it is intensifying its efforts to ensure the realisation of the continent’s 2063 Vision with the aim of achieving comprehensive economic and social development. “Our meeting this year comes at a time when we are all looking for further regional integration and facilitating intra-regional trade, especially after the African Union launched the Continental Free Trade Area (CTA) during the summit held in Kigali in March 2018,” President Abdel-Fattah Al-Sisi told the Africa Forum 2018 this week. He added that Egypt was looking forward to increasing its investments in the continent’s countries through joint and cross-border projects particularly in the areas of infrastructure, new and renewable energy, telecommunications and information technology. “We aspire to achieve these goals through joint action in the framework of the African Union,” Al-Sisi said. Intra-African trade now stands at 15 per cent of total African trade, according to a report by Afreximbank, an African bank. A 2018 report entitled “Boosting Intra-African Trade: Implications of the African Continental Free Trade Area Agreement”, showed that in comparison European countries do 67 per cent of their trade with each other. In Asia, the percentage is 58 per cent, and Latin America comes out at 20 per cent. With the theme of “Bold Leadership and Collective Commitment: Advancing Intra-African Investments”, the forum in Sharm El-Sheikh was organised by the Egyptian Ministry of Investment and International Cooperation and the Common Market for Eastern and Southern Africa (COMESA) Regional Investment Agency (RIA). The forum brought together more than 3,000 delegates, including heads of state, politicians and business figures. They put their heads together to discuss opportunities to boost private-sector engagement and intra-African investment, aiming to create a new economic system in Africa based on innovation, entrepreneurship and women’s empowerment. During the forum, Al-Sisi called on investors from Africa and abroad to take advantage of the promising opportunities in Africa to promote development and stability. He showed that Egypt has set an example by increasing its investments in Africa in 2018 to reach $10.2 billion. Intra-African trade and industrialisation are crucial to the prosperity and inclusiveness agenda articulated under the African Union’s Agenda 2063 development strategy, said the Afreximbank report. “Moving away from commodity and natural resource dependence is an indicator of success and transformation under the AU Plan,” it said. Howaida Abdel-Azim, head of Cairo University’s Institute of African Studies and Research, praised Egypt’s increased focus on Africa, much in evidence at the Africa Forum this week. Africa is Egypt’s “strategic depth”, and it should be a priority for Egypt, she commented. She pointed out that relations with the rest of Africa had been cold since the mid-1990s, but that had changed when Al-Sisi took office in 2014. She said that Egypt’s taking the helm of the AU next year would also help to build better relations with the rest of the African continent. Abdel-Azim stressed the importance of Egyptian investments and trade in creating jobs for African people. She also stressed that Egypt must boost the work it is already doing in the areas of education and healthcare as well as technical training for the African countries through the Egyptian Agency for Partnership for Development. Helping African countries realise their development goals is something that must be encouraged, she said, praising Egypt’s involvement in building dams across the continent. This week a deal was inked in Tanzania under which the Egyptian Arab Contractors Company will help build the Stiegler’s Gorge Dam that is expected to produce 5920 GW of power. Khaled Ramzy, export director for Fresh Electric for Home Appliances, an Egyptian company, acknowledged the opportunities in Africa, but said doing business in Africa was not always easy. While trading within COMESA countries had meant his company had been able to create awareness of “made in Egypt” products, doing business had not got easier over time, he said, adding that countries were putting up non-tariff barriers to make sure they did not lose revenues from customs. Each country in Africa has a set of standards that exporters must abide by, he said, and acquiring certificates of conformity with such specifications is not cheap, especially when sales volume does not justify the costs. He stressed that it was important for African countries to unify their specifications to facilitate trade among them. This point was also stressed in the Afreximbank report, which said that the African Continental Free Trade Area (AfCFTA) arrangement needed to go beyond a 100 per cent tariff reduction on all goods, as non-tariff barriers were also important constraints hampering welfare gains and efficiency in intra-African trade. Another issue faced by exporters, Ramzy said, was the shortage of hard currency because of difficult economic conditions in many African countries. This meant that Egyptian companies could receive payment for goods months after they had been delivered, Ramzy said. The solution, he suggested, would be to set up an account in which deals taking place between the two countries would be settled against each other. That would be a win-win situation because Egypt would be exporting its goods while importing its needs from Africa, he explained. For example, instead of importing meat from Australia, it could import it from Sudan or Ethiopia, countries with which it shares mutual interests, Ramzy said. Security and stability were other issues stressed during this week’s forum by Al-Sisi. “If we cannot maintain security and stability, this will negatively affect us all,” he said. Ramzy agreed, saying that while investing in Africa could make life much easier for manufacturers, it was not always easy for fear of political uncertainty. Instead, he said, investors opted for joint ventures with local partners and might not choose to rent warehouses or set up assembly lines. 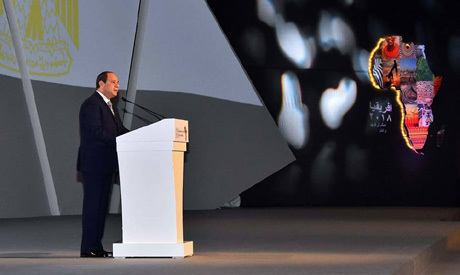 To make life easier for exporters, Al-Sisi said at the end of the forum that Egypt would establish an investment-risk guarantee to encourage Egyptian investors to channel their investments to Africa, to participate in the development of the continent, and to capitalise on the enormous opportunities available. However, one of the challenges of exporting to Africa was the cost of transport, Ramzy said. He said that though the government offered a 50 per cent discount on marine transport, that discount was only refunded later, which did not enable the exporter to pass on the discount to buyers. This also made exports from China and Turkey more competitive. What would make a world of difference in intra-African trade, Ramzy said, would be the materialisation of the Continental Free Trade Area. He wants a greater role for the government in boosting exports through trade representation offices and entry visa facilitation for businessmen. His dream is to see Egyptian hypermarkets open in African countries that would represent ideal outlets for Egyptian goods. The need to invest in infrastructure was another important issue raised at the forum. The success of the AfCFTA is linked to extensive infrastructure development and finance, the AfDB said. “Improving infrastructure, which is now a trade constraint, could enable African countries to engage more fully in intra-regional trade and reap the benefits of economic globalisation,” it said. The AfDB suggests that Africa needs $130 billion to $170 billion a year to close its infrastructure gap, an amount that exceeds the ability of African governments to finance. It suggested that development finance institutions (DFIs) could make infrastructure projects more bankable by contributing capital, technical expertise and capacity where the private sector cannot. Because of a lack of political stability in many of the continent’s nations and poor infrastructure, investment and trade are not an easy feat, but they are rewarding, Abdel-Azim said, adding that this was why major economies like China were heavily involved in the continent under the umbrella of South-South Cooperation. In fact, according to the Afreximbank report China is Africa’s single largest trading partner. “China-Africa relations are at an all-time high, with Beijing proving more than willing to extend its One Belt, One Road Initiative across the continent,” an April 2018 article published in the World Finance magazine said. The One Belt, One Road Initiative is an ambitious trade and development plan that seeks to connect most of Asia, a good part of Africa, and the entire Mediterranean basin. It was launched in 2013. Entitled “Bridging Africa’s Infrastructure Gap”, the article showed that China was financing 80 per cent of the $11.17 billion Nairobi-Mombasa Railway in Kenya.In Ethiopia, China is financing the Addis Ababa-Djibouti Railway with $4 billion. “Other nations are certainly helping with Africa’s infrastructure burden, including India and the US, but China is often considered the most noteworthy,” the article said. However, “there is a growing concern... that China’s infrastructural investments are not entirely altruistic,” the article said, adding that it was possible that the economic benefits of these projects would spur economic growth, but there were fears that if countries were unable to repay the sums, China could seek repayment through political agreements or favoured access to natural resources. The African states’ indebtedness to Beijing is estimated at around $130 billion. The forum included a Young Entrepreneurs Day (YED) that provided a comprehensive platform to support entrepreneurs as well as innovative ideas that can create unconventional solutions for African countries. The YED gave entrepreneurs the opportunity to meet investors and to enhance their skills through special workshops. “You are the most valuable asset to the continent. You are the drive and energy to create a better future for our continent,” Al-Sisi said to participants at the YED. The agenda also included a Women Empowering Africa Day (WEA), with the aim of encouraging a greater role for African women in building the economic and social development of their countries. At the end of the two-day forum, Al-Sisi made promises intended to support the African countries. These included an intention to increase technical cooperation with the countries of the continent in the areas of investment in human capital, digital transformation, management of international finance, governance and monitoring and evaluation systems. He also promised the establishment of a fund to invest in information infrastructure, in order to support the technological development and digital transformation of the continent and to build modern economies based on the latest technological systems. Al-Sisi boosted cooperation between Egypt and the countries of the continent in the fields of governance and fighting corruption through the exchange of expertise and the training and rehabilitation of bodies in the continent to spread a culture of good governance and eliminate corruption. He launched the second phase of the National Strategy for Combating Corruption (2019-2022) in celebration of World Anti-Corruption Day. And he decided to establish a National Anti-Corruption Academy and provide 250 training grants to African leaders working in the field of corruption prevention.